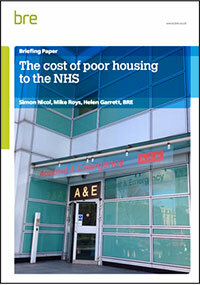 In 2010 the BRE Trust published the results of a research project which sought to quantify the cost of people living in poor housing in England to the National Health Service. This was possible because of the availability of information from the English Housing Survey on the risk of a home incident occurring and its likely impact on health, measured through the Housing Health and Safety Rating System (HHSRS), combined with information from the NHS on treatment costs. This Briefing Paper updates the BRE models and calculations using 2011 English Housing Survey and 2011 indicative NHS treatment costs. It also widens the definition from ‘poor housing’ to include all ‘sub-standard’ housing. include treatment and care costs beyond the first year. include other costs to society beyond treatment and care costs – eg the impact on educational and employment attainment of living in sub-standard housing. report in Quality Adjusted Life Years (QALY’s) as well as cost-benefits, to compare with other health impact research. 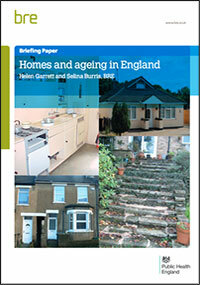 This paper uses English Housing Survey (EHS) data and the research methodology used for the BRE Trust briefing paper on 'The costs of poor housing to the NHS' (see above) to provide an overview of the housing conditions of older people, and to estimate the cost to the NHS in England, of the poor housing occupied by the older population. This older population is examined by four key age bands; 55 to 64 years, 65 to 74 years, 75 years and over and 80 years and over. National policy makers involved in the development of housing, health and social care strategies, particularly those at the Department of Communities and Local Government and the Department of Health. 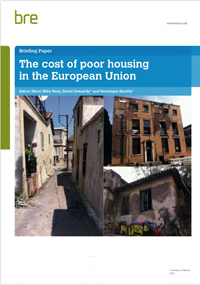 In early 2015, the European Foundation for Living and Working Conditions (Eurofound), having reviewed earlier BRE Trust publications on the cost of poor housing in the UK, contracted BRE to devise a methodology for quantifying the cost of poor housing across the 28 Member States that comprise the European Union. This had never been attempted before. The output of this research was to inform a wider publication entitled Inadequate Housing in Europe: Cost and Consequences, which is published by Eurofound in parallel with this research report. This report discusses how the quantification was possible and what the results show.